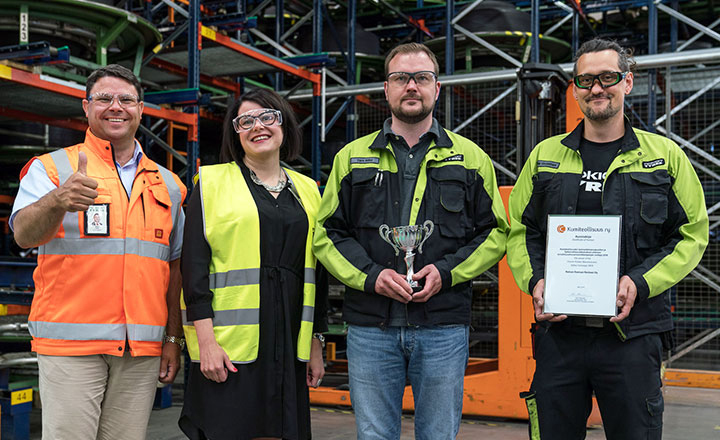 Nokian Heavy Tyres won the safety walk challenge campaign organised by Rubber Manufacturers' Association of Finland (RMAF). The campaign for raising safety awareness took place on RMAF’s Safety Day, 27 April. The goal was to carry out as many safety walks as possible during the day and to further improve companies’ safety culture. During the event, Nokian Heavy Tyres recorded an incredible 125 safety walks. – Our performance was excellent. Safety walks were conducted by office personnel and workers alike, says Manu Salmi, Vice President, Nokian Heavy Tyres. VP, Nokian Heavy Tyres Manu Salmi, Specialist Anni Siltala from Chemical Industry Federation of Finland, Development Manager Tero Mäki and Operator Ville Virolainen in an event celebrating the Nokian Heavy Tyres personnel’s efforts in June. This year, Nokian Tyres has already implemented more than 2,500 safety improvements in Finland. The award-winning Heavy Tyres business unit has made more than 3.5 safety improvements per employee. Last year, Nokian Heavy Tyres managed to eliminate eight out of ten injuries, and the Components department reached one thousand days without accidents. Safety observations that lead to corrective actions are essential, but positive safety observations are also significant. – By making observations and discussing safety on a daily basis, we are contributing to an even safer workplace, Salmi explains. Nokian Tyres is constantly working towards improving the company’s safety culture. – We are promoting occupational safety comprehensively, developing risk management processes, investing in state-of-the-art technology and continuously improving our ways of working. A safe working environment is a fundamental prerequisite for our operations. Our uncompromising goal is to ensure that everyone gets to home healthy at the end of their working day, Salmi adds. Read more about Nokian Tyres’ safety efforts in our Corporate Sustainability Report for 2017!